I just wanted to thank you so very much for my spectacular birthday cake!! My friends and family have still not stopped talking about it - it truly was a work of art that befitted my 50th birthday celebrations. The French side of my family were truly impressed with your creation, and I have no hesitation in recommending She Bakes to everyone who wants a special cake for whatever occasion. I wish you all the best with the business. She Bakes is mentioned in this wonderful article covering the really fun and lively wedding of Charlie and Barney in Tunbridge wells. Click the image above to read it. "Jen went out of her way to make the most fantastic topping for our wedding cake. 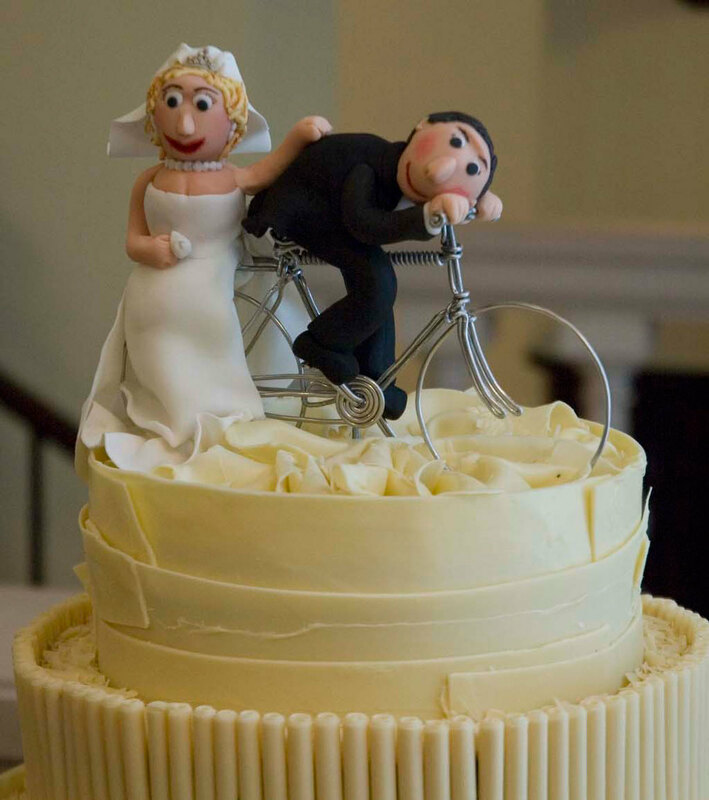 My husband is a keen cyclist and Jen's ingenious design of the bride and groom on a tandem made everyone smile! The cake itself was decorated in beautiful white chocolate icing which made it look wonderfully festive for our winter wedding. What's more, the inside - two tiers dark chocolate, two tiers fruit - was so delicious, there was very little left at the end of the night for us to bring home! A great success." "Just wanted to say a big THANK YOU for your gorgeous cake. Not only did it hit the spot perfectly with regards to the 'comedy cow' I had requested but it tasted superb. Everyone has been texting me saying how yummy it is/was. I only wish I hadn't given it out and had kept more for myself! I will be back next time I have a (feeble) excuse for more chocolate cake!" I can't thank you enough for your fantastic master piece. The Croquembouche was a complete success and out did all my expectations!! I will, without doubt be in contact for all my future cakes.